Enjoy this wonderful journey through 20th-century America and the music it gave to the world. Full of iconic sights and indelible sounds that formed the soundtrack to our lives, you’ll begin in bustling Chicago. You’ll get the opportunity to take in Cleveland’s Rock & Roll Hall of Fame and Detroit – birthplace of Motown – before heading south to explore the great cities and surrounding countryside that gave the world bluegrass, country, blues and jazz, and was home to a galaxy of music’s brightest stars. Flights also available from other UK airports – London Heathrow, Manchester & Newcastle – click here for more information on available dates and prices. Fly to Chicago and upon arrival, meet your tour manager and transfer to the hotel for a two-night stay. Rest and relax after the journey. The Windy City is yours to savour and enjoy. Join our optional guided tour of this vibrant metropolis, and don’t miss the opportunity to view it all from one of the city’s famous skyscrapers. Wander through the lakefront park and perhaps take in a famous blues club this evening. The city has no shortage of dining options. Journey around Lake Michigan, heading across Indiana, beside Lake Erie to Cleveland – home to the world-renowned Rock & Roll Hall of Fame. Check into the hotel and take the opportunity to enjoy an evening in one of the city’s music clubs. Today you’ll visit the Rock & Roll Hall of Fame, which pays homage to the world’s most exciting musical genre – rock and roll. With a roll call of rock royalty, early influencers, pioneering record producers, music-business icons and latterly stars from the worlds of hip-hop and r’n’b amongst its 300-plus inductees. With its fascinating exhibits, the museum is a must-see for any music fan. After the visit, travel back around the lake for a two-night stay in Motor City Detroit. This morning, visit the legendary Hitsville USA Motown Museum, where in 1959, Berry Gordy Jnr founded the all-conquering music label. Stand in the renowned Studio A, where The Supremes, Temptations, Smokey Robinson and other stars recorded their first hits, and relive the tracks of your years. This afternoon, explore the broader history of modern America at the Henry Ford museum, an eye-popping living museum of exhibits that reflect the ingenuity of America and the impact of the nation upon the globe. Return to the hotel at the end of a wonderful day. Begin your journey south through Ohio, to Louisville, home of the Kentucky Derby and birthplace of the Louisville Lip – Muhammad Ali. Dependent upon your arrival time, take in some of the city’s sights before retiring to your hotel for the evening. Journey to Rosine, Kentucky, birthplace of bluegrass legend and father of country music, Bill Monroe, whose ‘Blue Moon of Kentucky’ found worldwide fame as Elvis’ first B-side. Connections with the King continue as you head to Nashville for two nights in a city where Elvis made many recordings. 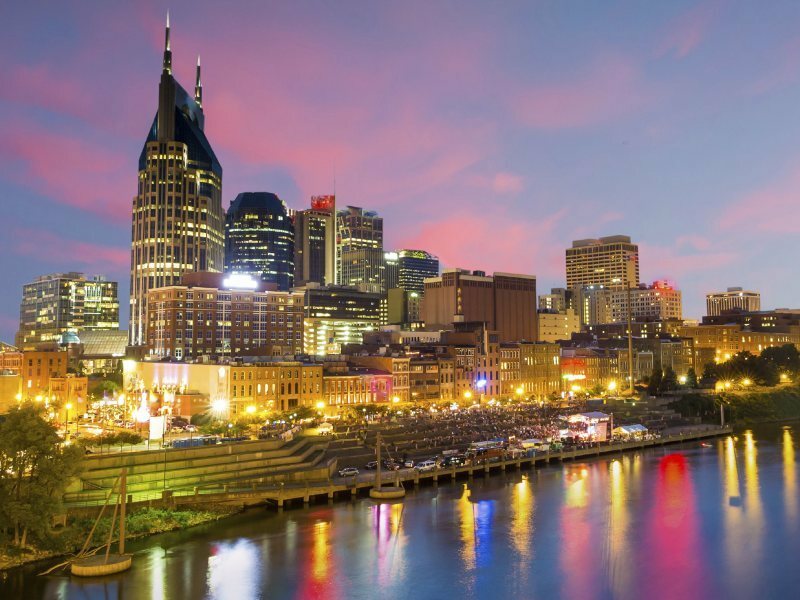 Explore delightful Nashville, site of the historic Ryman Auditorium and the Grand Ole Opry,and home to sights including the legendary Ernest Tubb Record Shop, Studio B – where countless country standards and a galaxy of Elvis’ hits were recorded – and the Country Music Hall of Fame. This evening, perhaps catch some live music in this song-writing mecca. A short journey brings you to Elvis’ beloved hometown Memphis, which, in addition to links with The King, boasts a world-class musical heritage. This evening, soak up the atmosphere of colourful Beale Street and spend the first of two nights at the Elvis-themed Guesthouse at Graceland™. Enjoy included visits to legendary Sun Studio as well as the most famous southern mansion of all, Graceland, home and final resting place of The King. This evening, why not try some delicious pork ribs in America’s barbecue capital? Journey south on Highway 61 across the Mississippi Delta, the ‘cradle of the blues’, passing Clarksdale of ‘Crossroads’ fame and visiting Indianola’s fascinating B B King Museum, before continuing to New Orleans for a two-night stay. Join this morning’s optional guided tour of the Big Easy city, including the legendary French Quarter and neighbouring Treme. This afternoon, perhaps take the optional Bayou & Alligators excursion for a glimpse of the city’s surrounding countryside. Head back to the Quarter tonight, for another taste of Dixieland jazz. Bid farewell to the Big Easy and journey west, across the Bayou country towards Texas and Houston, for a last night’s stay. Enjoy a brief glimpse of the oil-rich city and perhaps celebrate your arrival in the Lone Star State with a Texas steak dinner. A guided tour introduces Houston’s highlights, before the holiday ends with a visit to the world-famous NASA Johnson Space Center, heart of the Apollo missions. Transfer to Houston airport for your overnight flight home. Arrive back in the UK, at the end of your musical journey.